“In a sense Lipstadt sees herself as similarly carrying on the legacy — speaking, via her scholarship, for a generation that can’t speak for itself. As depicted in the film, survivors would come up to her outside the trial and ask why none of them could testify; she had the difficult task of explaining to them, and herself, why the unimaginable possibility of silence was actually the wiser course and that allowing Irving to harangue them or twist their words in a cross-examination setting would do neither them nor the case any good. Tehila Sasson is a Past & Present Fellow at the Institute for Historical Research, London, and a visiting research fellow at the Centre for History and Economics at the University of Cambridge. In 2017 she will join the History Department at Emory University as an Assistant Professor. She is currently completing a book manuscript with the working title We Are the World: The End of Empire and the Rise of Global Humanitarianism, which traces how in the second half of the twentieth century, ordinary people were mobilized to join a global community of aid. She is the author of “From Empire to Humanity: The Russian Famine and the Imperial Origins of International Humanitarianism,” which appeared in the Journal for British Studies in July 2016. She is also working on an economic, legal, and environmental history of the rights to ownership of natural resources and the origins of global environmental justice in the twentieth century. This article traces the history of the Nestlé boycott, one of the most well-known and successful boycotts of the 1970s. As part of the campaign to end bottle-feeding in Third World societies, it called for the global regulation of controversial marketing strategies implemented by Western formula companies. The story adds a crucial yet understudied aspect of rights discourse in the 1970s, when humanitarian activists strove to reform the global market and create ethical forms of capitalism. The history of the boycott may seem like a marginal tale within this history, but it is illuminating both for what it teaches us about the role of multinational companies, ethics, and the market in the period, and for what it reveals about the global history of human rights and humanitarianism. The history of the campaign allows us to uncover how in the 1970s not only diplomats and non-governmental organizations, but also ordinary people, business experts, and even multinational corporations became part of the project of feeding the world’s hungry. By politicizing breastfeeding, the Nestlé boycott played an important role in changing how those in the Third World were conceived by aid programs, transforming them from producers to consumers in the global market. While international attempts to limit the power of these corporations have failed, the Nestlé boycott became a somewhat minimal solution that emphasized the moral responsibilities of corporations. It offered a “weak” form of utopianism that emerged after the end of empire and attempted to reform global inequalities through the market. Click here to read the full article. AHR Cover Illustration: In 1977, a boycott was launched against the Nestlé corporation, a well-known manufacturer of infant formula. As part of a campaign to end bottle-feeding in Third World societies, humanitarian activists called for regulation of the controversial strategies being used by Western companies to market breast milk substitutes to women in underdeveloped nations. In the increasingly global and deregulated economy, they claimed, multinationals like Nestlé exploited vulnerable consumers in order to profit from Third World female poverty. Both citizens and aid experts took part in the boycott, which led to the creation of the first international set of standards regarding global corporate responsibility. In “Milking the Third World? Humanitarianism, Capitalism, and the Moral Economy of the Nestlé Boycott,” Tehila Sasson argues that while knowledge of the dangers of bottle-feeding had been circulated long before the 1970s, it was only in this period that a movement of “global citizens” mobilized and transformed such knowledge into a new moral and political economy of “ethical capitalism.” In the process, Sasson shows, boycotters positioned residents of the underdeveloped world as global consumers, not just producers. “Boycott Nestlé,” 1978. Artist: Rachael Romero, San Francisco Poster Brigade 1978. Dr. Joseph Crespino, Jimmy Carter Professor of History, recently participated in a discussion about history and poetry with Natasha Trethaway, Robert W. Woodruff Professor of English and Creative Writing, director of the Creative Writing program and former U.S. poet laureate. 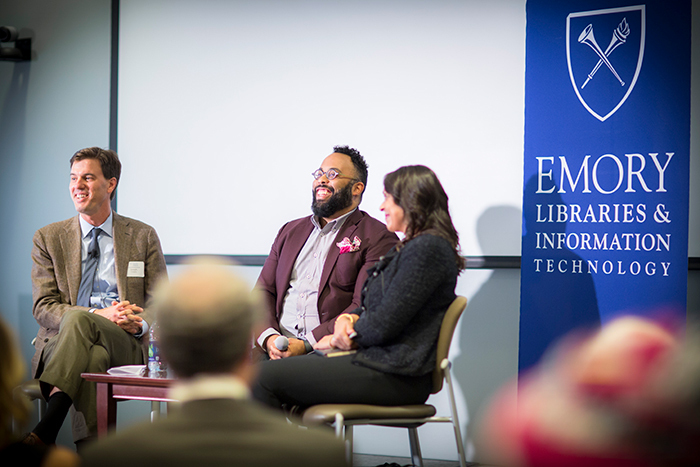 Moderated by Kevin Young, Atticus Haygood Professor of English and Creative Writing and curator of the Raymond Danowski Poetry Library, the conversation marked the 8th edition of the “Neil Asks” event. Check out an excerpt from the Emory News Center article below and read the full piece. Both Crespino and Trethewey agreed that, with history and poetry, “there is always borrowing across the line,” as she noted. Crespino views that borrowing as a necessity, saying that even with regard to 20th-century history, where we are blessed with so much source material, still “there are so many silences in the archives” that need unpacking, whether by poets or historians. Dr. Carol Anderson, Samuel Candler Dobbs Professor of African American Studies, was recently quoted in a U.S. News article “Donald Trump’s Dismal Appeal to Black Voters,” written by Joesph P. Williams. Anderson analyzes Trump’s recent comments on contemporary race relations and his strategy to gain support among black voters. Anderson is the author of White Rage: The Unspoken Truth of Our Racial Divide (Bloomsbury, 2016). Read an excerpt of the article below or the full piece. Anderson doubts the college-educated whites Trump apparently covets would go for such a bald appeal to racial solidarity, but she argues the problem is with the messenger – in this case, a bombastic, occasionally crass, former reality-TV star – and not the message. Dr. Deborah Lipstadt, Dorot Professor of Modern Jewish History and Holocaust Studies, authored History on Trial: My Day in Court with a Holocaust Denier (Harper Perennial, 2005) about her experiences in 1996 facing libel charges for asserting that British author David Irving had distorted truth in his denials of the Holocaust. A decade after the book’s release, Lipstadt’s trial will be the subject of the film “Denial,” opening October 7 in Atlanta. Read more about Lipstadt’s story and the film.